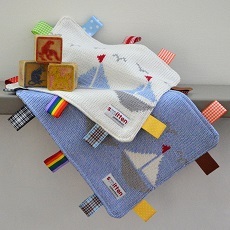 Beautiful handmade comfort blanket for babies, featuring a knitted sailing boats motif on the front, spotty fabric on the reverse and edged in a variety of colourful ribbons. This baby comforter is available in cream and blue. The cream colourway is backed in blue woven fabric printed with white spots and the blue colourway is backed in Cream fabric printed with red spots. The greatest care goes into selecting all components of Smitten products. The woven fabric on the reverse of this this knitted baby comforter has been handpicked to compliment the motif design and luscious yarn colours shown on the front. The combination of textures used to create this handmade baby comfort blanket provide a range of tactile experiences for little hands to explore, encouraging interaction and stimulation. For a unique personalised baby gift, knitted baby comforters can be customised with a name, initials or date of birth (up to 7 characters). If you would like to personalised your comfort blanket please select ‘personalised’ from the drop down menu and enter your required text in the box. If you would like to customise your comforter with more than 7 characters, please contact us to discuss your requirements. Your chosen text will be knitted integrally on the front of the baby comforter in red. Lovingly design and handmade in England. Smitten knitted comforters are approximately 26cm width x 21cm height. Perfectly sized and lightweight enough for little hands to carry around for snuggles on the go. All Smitten baby comforters can be machine washed on a wool cycle up to 40 degrees. Iron if necessary on the woven fabric reverse.